As shown above on a bumper in Oregon. We make our beautiful "Kids Need Both Parents" bumper stickers available to people all over the country, at no cost! They have black lettering on a white background, with red hearts and red adornment. Please send to us a self-address, stamped envelope (size #10, standard business) to the Kids Need Both Parents Center, PO Box 6481, Portland, Oregon, 97228-6481. Please put a first class stamp (41 cents) on the envelope if you would like 1 to 3 bumper stickers. Please add an additional ounce stamp (23 cents) if you would like 4 to 6 bumper stickers. Please specify how many bumper stickers you would like. When you receive them, please make sure only to put them on your own property, or to distribute them to people who will only put them on their own property, and so forth. Thank you very much. 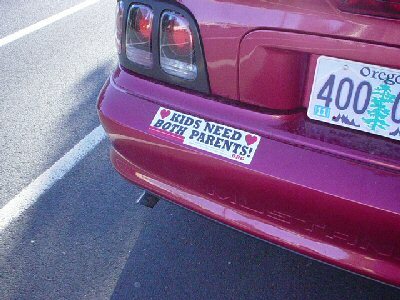 We have a huge supply of "Kids Need Both Parents" bumper stickers. This is part of our ongoing "100,000 Bumper Stickers Project", an effort to spread this well-received message all across the nation. If you would like larger numbers, please contact Jim Whinston, 503-224-9477. We have distributed 63,000 "Kids Need Both Parents" bumper stickers so far!